ACDF provided an engaging and functional environment to a technology firm in full bloom. This union of the past and present reflects AdGear’s growth, always looking towards the future but not forgetting its past. 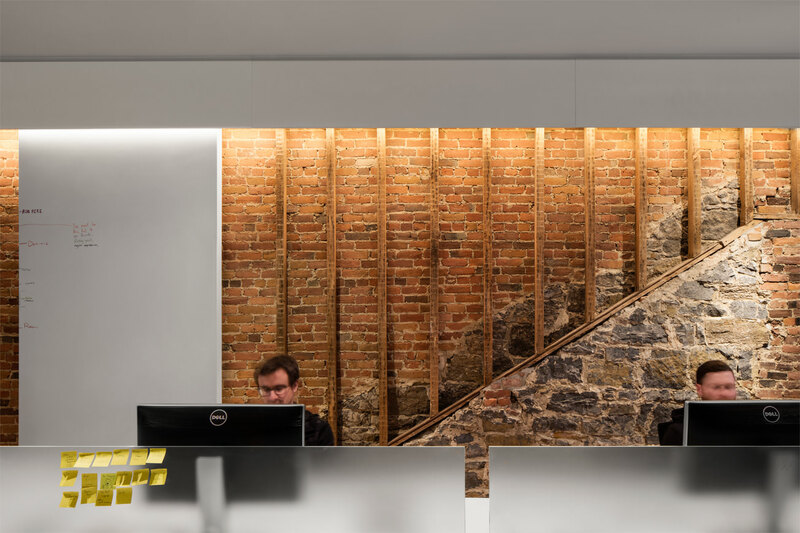 AdGear – a digital marketing agency founded in Montreal in 2010 – commissioned ACDF Architecture to design its new headquarters located on McGill Street, in Old Montreal. 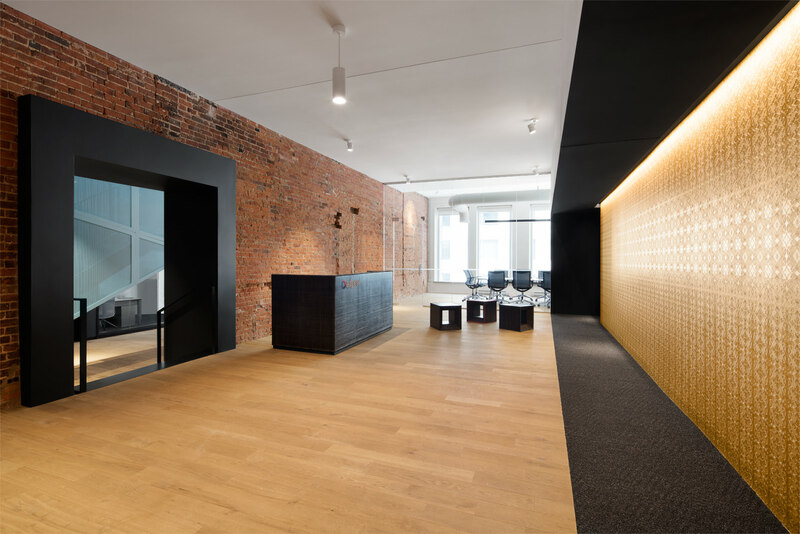 The agency, an independent branch of Samsung Electronics, needed a functional environment for its 60 employees. 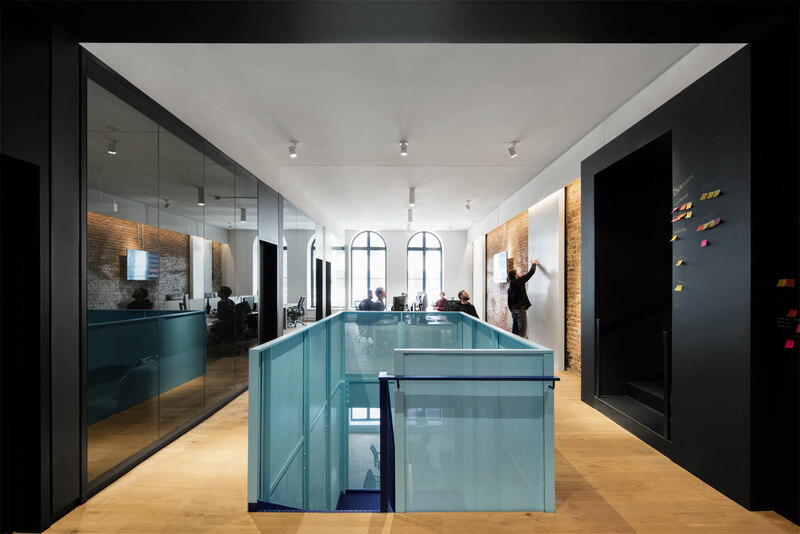 ACDF chose to develop the space of two adjoining buildings using the common wall to designate two distinct zones. On one side, a casual, open area unfolds, while the other side is devoted to office space. On both floors, the rough red brick and stone of the central wall compliment the polished glass panes used to separate the individual offices. Like a mirror, the slick and elegant surface reflects and exhibits the richness of the building’s original materials. ACDF knew how to masterly exploit their findings during the construction phase. Their new design highlights the visible beams, the stone inserts, the brick patterns, and the imperfections, which together tell the story of the building. Sections of golden wallpaper add a touch of nobility to the space with their texture that calls to mind elegantly embossed tin ceilings. The black walls surrounding the wallpaper create a velvet-like display for the shiny paper. 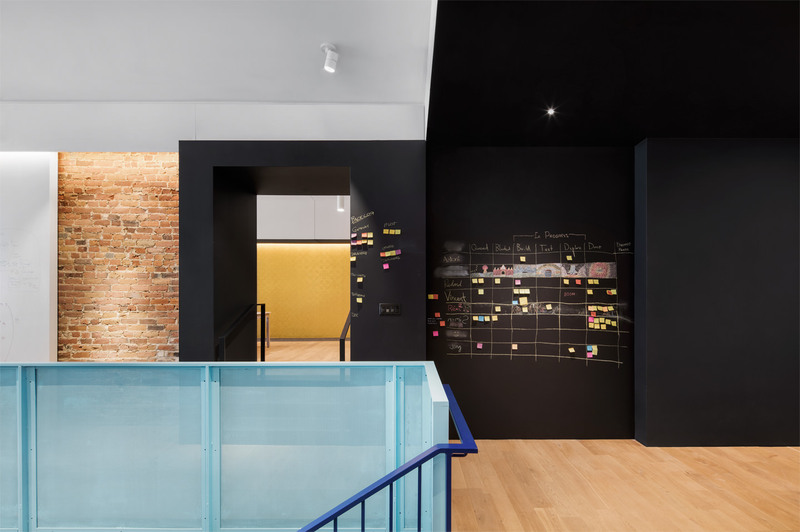 Black chalkboard walls located at the center of the open space and whiteboard panels cleverly positioned against the surrounding brick encourage developers to really own their environment by writing on the walls. By keeping an open floor plan and taking advantage of the glass panels, ACDF’s design allows light from both the front and rear of the building to meet in the center and illuminate the space. 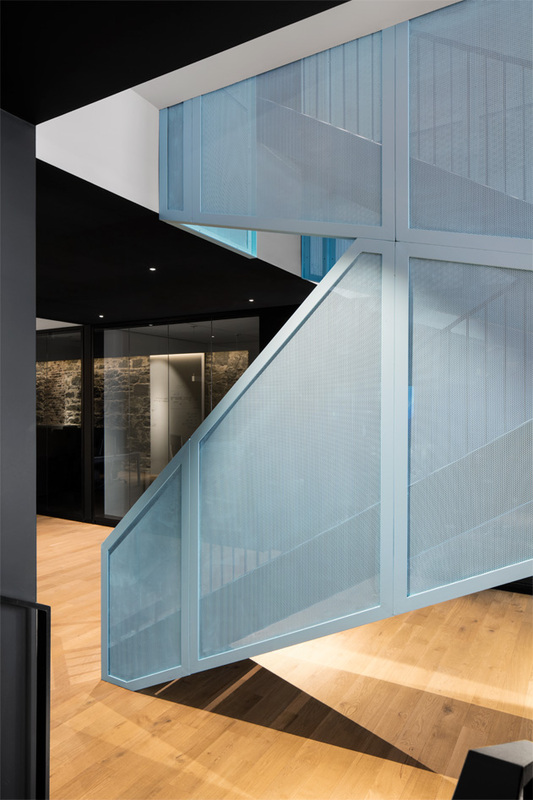 The central staircase plays with the lengthy dimensions of the offices, letting the sunlight pass through its openwork steel structure. 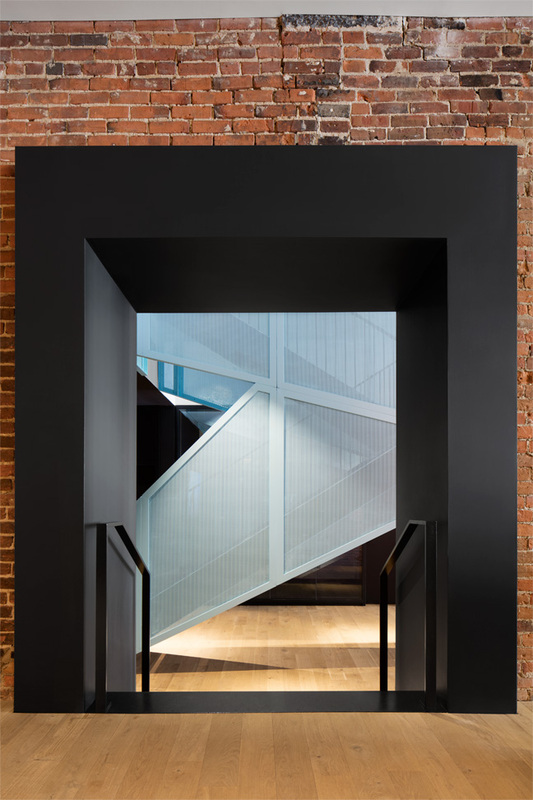 The staircase evokes images of the building’s industrial past, while its angular geometry belongs to a more contemporary era. Its structure plays with the different depths of its materials, continuing the theme of contrast that defines AdGear’s headquarters. The staircase also possesses a unifying nature. More than just a connection between two areas, it encourages employee cohesion and nourishes strong team building.